The MFM1P 6000, A Simply Amazing Culminating Activity! Akin to using mini-whiteboards, students are most willing to attempt math problems when they know it is not a test situation and it’s okay to make mistakes! Allowing students to revisit questions done poorly until they achieve a perfect top-3 average score, and letting them practice prior to attempting a ‘for keeps’ problem, puts the focus on learning not performance. Students can ‘chase’ their mistakes and improve, rather than rage-quit! This truly assesses their “most recent, most consistent” understanding. Every problem has a YouTube help video link walking through a similar type of problem. Students are driven by personal challenge and customization. They have choice over the order and difficulty level of the problems they attempt, driven by the goal of earning $6000. Students are motivated to improve their understanding when they receive instant growth-mindset feedback! Every problem has a ‘smart’ answer check built into it, catching likely errors the student made and responding accordingly. With a full breakdown showing the percent of their score earned from each curriculum strand, as well as the percent of time they spent on each strand, you gain useful knowledge of their strong and weak areas. If you care to dig deeper, you can also see the feedback they received after each attempted problem. I used this data to customise a stations based 'exam' activity, choosing specific stations for individual students. You can save the game to a public folder where students can access it, or have them download it from this page. Please note that anti-virus software will flag ANY executable file from an "Unknown Publisher" as potentially dangerous. If you see "... download is dangerous" or "...is not typically downloaded", be assured that this software is not malicous! Click "accept the risk" or "download anyway" etc. When you go to run the software, Windows may also caution you. 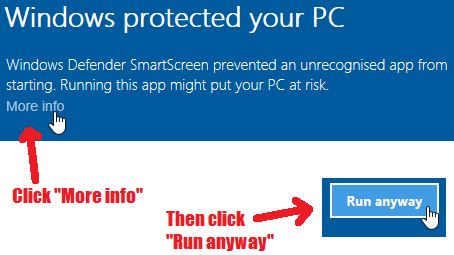 Click "more info" and then "Run anyway". The game is a Windows Desktop Application (coded in vb.net), and requires Microsoft's .net framework to run. You can run it on a Mac if you have things set up to boot Windows. If you're not sure, just download it to see if it runs! When students run the program and create a login, their game is saved at a text file (.txt). They select the location where this will be saved to. It could be their local network drive, or a thumb drive, etc. Just make sure they don't select a folder that gets wiped out when they log off! Sometimes I ran into an issue on Windows 10 computers where students were unable to run the program from their "my documents" folder. A workaround seemed to be drag-and-dropping the .exe game file into the "downloads" folder found in "My PC". It ran from here with no issues. If there are any bug fixes or updates, you can grab an updated game file here! To earn 100% students need to earn a total score of $6000 or better. Students must complete at least 2 problems from every category. 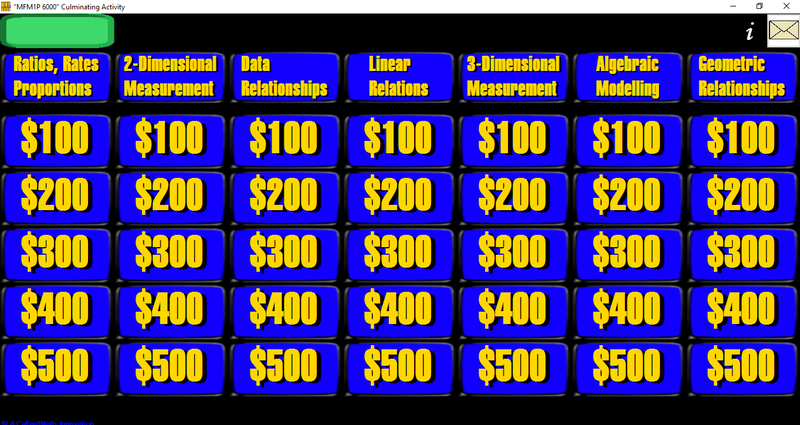 Problems range in difficulty from $100 to $500, and span the course overall expectations. Topics Include: Ratios Rates and Proportions, 2-Dimensional Measurement, Data Relationships, Linear Relations, 3-Dimensional Measurement, Algebraic Modelling, and Geometric Relationships. When students click on a problem from the home screen, it begins in practice mode by default. A partial score can be earned for a near-correct solution (e.g. rounded incorrectly, forgot to divide diameter by 2, etc.). A Student's top three practice attempts get averaged and counted as their reported score for that problem. Students can keep doing practice problems until a perfect average is achieved! Earn full points in one shot! A student can earn full points in one shot, without needing to complete 3 practice runs. If they've tried a few practice problems and feel the've got the hang of it and could ace a new problem, they can override a lower top-three average in one "for keeps" attempt. If they mess up their "for keeps" answer, no worries! They can still do more problems to earn a perfect top-three average score. The better of the two will count as the reported score! Displays the top three scores for the student's practice attempts at the problem. The better score between their top-3 average and their “for keeps” score (if any) is the one reported. Shows that the maximum possible score has been achieved for a particular problem. This can be done by getting the “for keeps” problem perfect, OR through a perfect top-3 average at any time! Partial points... gotta get it green! Shows that a higher score can still be earned for a particular problem by completing more practice attempts until a perfect top-three average is achieved. Practice problems may still be completed after a "for keeps" attempt gone wrong! Opens a helpful YouTube lesson in the default internet browser. Tell students to bring some headphones to class! (Or, more realistically, tell them to plug them into the computer instead of their phone!) The videos strive to present the material in a way consistent with the Ontario curriculum and grade 9 applied course. Each problem has a space for students to write reminders to themselves. (e.g. “divide pyramids by 3” or “remember to divide diameter by 2 to get radius”.) These notes remain visible during "for keeps" questions, helping them learn from their practice attempts. Don't worry, there's a language filter in place to keep it PG. This takes students back to the main screen where they select a problem. If they were in the middle of a "for keeps" question, it will persist until an answer is submitted. Practice Mode questions will not be saved, but rather a new question is generated every time the problem is opened. When students have completed a minimum of 2 problems from each category, they can click the envelope button to email as summary of their results to their teacher. Alternatively, they have the option of selecting a 'hand-in' folder to save their results to. Click on a problem to see its description, specific expectations, and YouTube help video link. Just double click on an image or problem to copy it! This is really handy for making quizzes or tests, especially for diagram problems. You'll see a little clipboard image flash to let you know it copied. When a student emails their completed culminating activity to you (or saves it to a hand-in folder), you receive a breakdown of their total score by strand (e.g. "25% came from Data Relationships"), as well as a percent breakdown of the total time spent per strand. If you care to dig deeper, you are also told how many practice runs were attempted for each problem and the feedback that was received each time. Putting this data together can be very informative! i.e. "I see Sally spent nearly 2 hours on ratios, rates and proportions and completed over 15 practice problems for the percentage problem! She earned a fair chunk of her $6000 in this category, so her understanding really grew!" Questions? Suggestions? Feedback? Bugs discovered? Typos? I'd love to hear from you! [2018-08-29, 2:00 pm] Lots of updates! Students' gamefiles are now hosted online! So no more .txt file saving and opening (although a backup txt file can still be saved). Teachers now create class codes (like Desmos or Kahoot) that link students to a class. Students enter this when creating their login, or later by clicking on the gear button in the top right corner. Teachers can view all their students' progress from within the game (click the gear button to open the menu panel) and can also change students' names, passwords, or save a local gamefile. No more emailing! I hope this is a lot smoother for you and your students! Now they just need to download the program at home and they can continue their game since it is automatically saved. [2018-06-01, 12:26 pm] Two minor bug fixes: 1) 3D measurement volume problems sometimes said (erroneously) that units were incorrectly. 2) If you used the "Clear Session (erase all data)" option from the top secret teacher panel (Ctrl+Alt+T) it would erase the student's password too. I'm not sure anyone has ever wanted their game data erased... but anyway, now it will preserve their password! [2018-04-21, 12:45 am] It seems that the option for students to email their work when they hand it in was a bit glitchy (authentication error). I haven't completely fixed this problem, but as a work-around, it handles this error by allowing them to save a local html file with images in a zip folder. They can attach this to a personal email if you would still like to receive it that way, or they could submit it to a drop box or hand-in folder you set up. [2018-01-23, 12:54 am] Square-based pyramid problems now give "b = " rather than "l = and w = " so that it better matches the EQAO formula sheet (MFM1P only does square based pyramids). I colour coordinated the buttons for a "new problem", "check answer", and "for keeps" making each page visually easier to navigate through familiarity. I added a corny cartoon me that pops up to welcome you when you start the game, and to give some tips as the need arises. (lets them know the goal is $6000, that they can still get perfect even if they messed up a "for keeps problem", etc.) I fixed a few bugs: The geometry column now persists unfinished "for keeps" problems after you log out and back in, and the diagram won't crash when you try to draw on it. The sphere problem now recognizes if a student used diameter and gives feedback. The collecting-like-terms problems now ignore spacing in students answers (previously is was not giving points if there were spaces). [2017-11-27, 1:51 pm] Now students can click on their name at the top left to see a summary of their work (like the one teachers receives when students submit their work). I also improved the "tab order" to make it easier to navigate textboxes with the keyboard, and the Enter key now triggers the "check my answer" button. [2017-11-22, 1:05 pm] Now there are fireworks when you reach the goal of $6000 and return to the homescreen! I agree, something cool needed to happen! [2017-11-18, 11:57 pm] Fixed an issue where YouTube help videos didn't load when Chrome was the default web browser (it would try to download the video as a shockwave file). And one update: I added drag-and-drop functionality (rather than just click) when adding algebra tiles in Algebraic Modelling $100 and $200, since this is consistent with what students use on a Smart Board with its "Infinite Cloners". [2017-11-16, 12:15 am] Fixed an issue where students' scratch notes weren't persisting/saving. 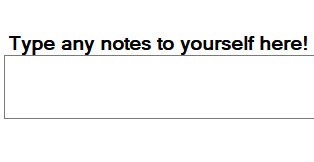 Update... you now receive a summary (by strand) of their notes when they hand in their work. Also, I added a "change student username" button in to the secret teacher control panel, in case for whatever reason you need to to change a rediculous name, or fix a typo.